Eating a gluten free diet, out of necessity or choice, is not always the easiest task. Gluten is lurking in places we may not suspect. After years of living gluten free out of necessity, I get tired once in a while of making separate meals for my family or serving them a meal and hearing “This is gluten free isn’t it?” Developing recipes that are full of flavor, easy to make for a family, and most importantly gluten free, is a challenge I am always up for. 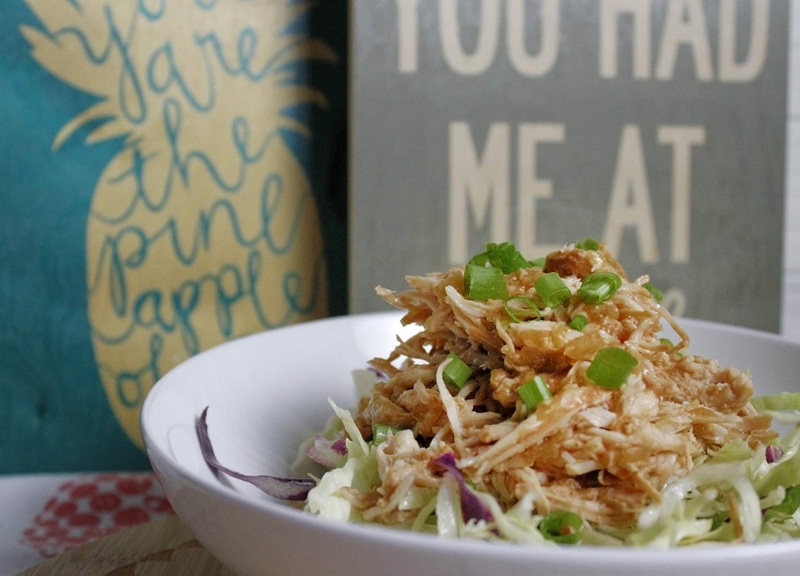 You can even throw in dairy free restrictions with this slow cooker Hawaiian chicken recipe. 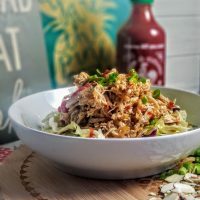 You don’t need to be gluten or dairy free to love this slow cooker Hawaiian chicken recipe, is inspired by Huli Huli Chicken, a local favorite in Hawaii. This decidedly untraditional but tasty version is made completely gluten free, dairy free and even a little healthier than the grilled original. By cutting out the super salty soy sauce and swapping a few ingredients for the sugary ketchup, this recipe is one you can enjoy any day of the week without guilt. Soy sauce has been replaced by Coconut Aminos, although you can use a gluten free Tamari sauce as well. 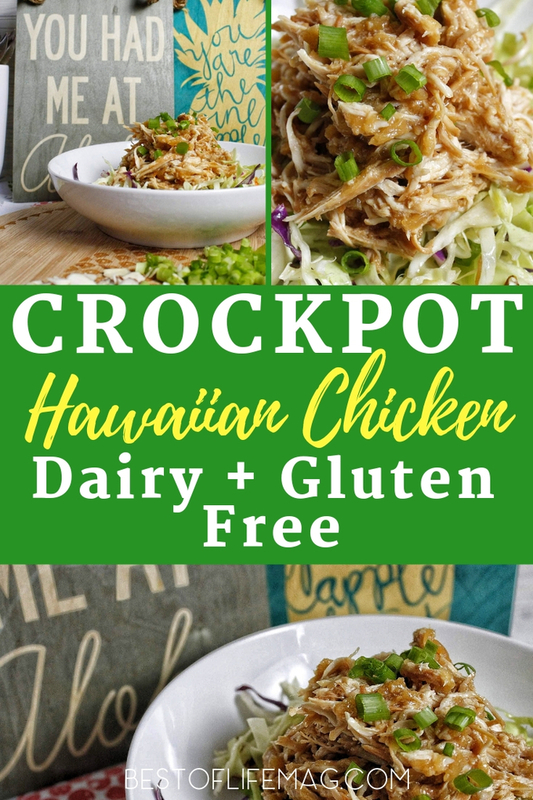 Best of all the chicken and the sauce cook together perfectly in your Crock Pot, making the best slow cooker Hawaiian chicken recipe. You just go about your day and come back later to a great dinner. If you remember those sweet and salty slow cooker dishes your mom used to make, I bet there was a pineapple chicken in that rotation. This is not that dish! The lightly sweet sauce relies on just a little brown sugar and pineapple. What it lacks in the old sticky sweetness, it makes up for in a gingery and tangy kick. The chicken could be the star, but since chicken has little to no flavor on its own, the sauce will be the stand out star. This recipe uses coconut aminos instead of soy sauce to make it gluten free. It still packs the umami punch of a traditional soy sauce so no one will be able to tell the difference! The recipe is very close to the traditional recipe with brown sugar, honey, lime, pineapple juice, and tomato paste. There is a little spice added to the recipe with ginger and garlic, but it’s mild and beautifully balanced. Another important tip is to keep corn starch and water nearby. Corn starch mixed with a little water is a good way to thicken up the sauce if needed. Spray the inside of your slow cooker with non-stick spray (optional). You can also use some liners to make your cleanup easier. Rinse and pat dry the chicken breasts. Then place them in the slow cooker. In a medium bowl, combine the brown sugar, coconut aminos, honey, tomato paste, pineapple, ginger, garlic, vinegar, and the lime juice. Whisk until smooth with just pineapple chunks. Sprinkle the lime zest over the top. Turn your slow cooker to low and cook for 8-10 hours. Once the chicken is cooked, remove the breasts from the sauce and place in a large bowl. Shred the chicken using 2 forks, until you have an even consistency. OPTIONAL: In the meantime, turn the slow cooker to high heat and combine the cornstarch and cold water in a small bowl or cup. Slowly add it to the sauce over high heat, stirring the whole time to combine and thicken the sauce. Cook for about 10 minutes. When the chicken is shredded and the sauce has thickened to your liking, place the chicken back into the slow cooker and combine the sauce with it. Turn the Crock-Pot to off or warm. 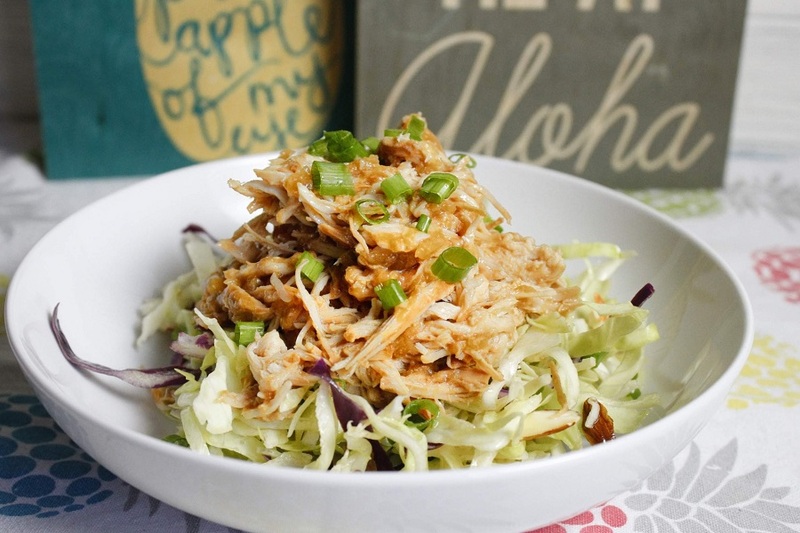 To keep the meal gluten free, serve the slow cooker Hawaiian chicken recipe with rice or over cabbage slaw. Top with scallions and, if you want a little extra kick, a drizzle of hot sauce — Sriracha is my favorite! 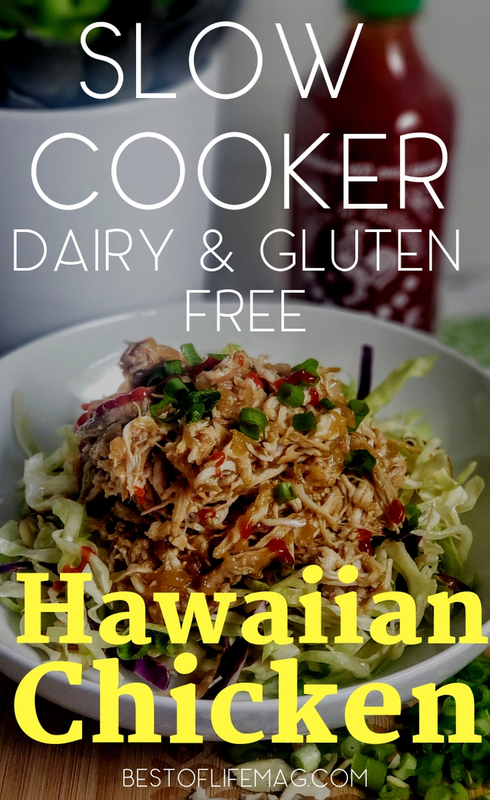 A dairy free and gluten free slow cooker Hawaiian chicken recipe like this one is full of flavor and inspired by Huli Huli Chicken, a local favorite in Hawaii. Spray the inside of your Crock-Pot with a nonstick spray (optional). Turn your Crock-Pot to low and cook for 8-10 hours. OPTIONAL: In the meantime, turn the Crock-Pot to high heat and combine the cornstarch and cold water in a small bowl or cup. Slowly add it to the sauce over high heat, stirring the whole time to combine and thicken the sauce. Cook for about 10 minutes. When the chicken is shredded and the sauce has thickened to your liking, place the chicken back into the Crock-Pot and combine the sauce with it. Turn the Crock-Pot to off or warm. To keep the meal gluten-free, serve the Hawaiian Chicken with rice or over cabbage slaw. Top with scallions and hot sauce, I use Sriracha, for a little extra kick!